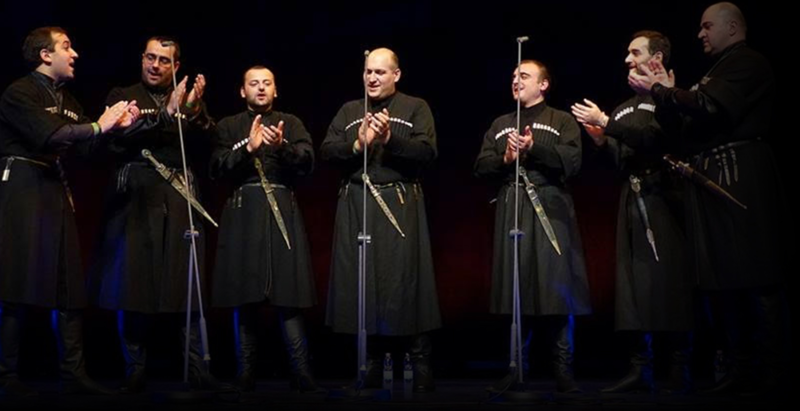 The Republic of Georgia is known for its ancient tradition of vocal polyphony and improvisation. New groups like Iberi - led by a rugby star who gave up the sport to sing - are bringing the tradition into the 21st century. In the mountains and along the coasts of Georgia, the ancient country that straddles the Caucasus Mountains, songs have echoed for centuries. Villages and regions developed their own distinctive approaches to melody and harmony, to style and timbre. These songs ring on, finding new life in the rich voices of Iberi. The six-person vocal and instrumental ensemble channels Georgia’s multitude of sounds, exploring the emotional potential of age-old polyphony and traditional instruments. Iberi embrace every aspect of these traditions, including the toasts and feast songs that are intimately entwined with Georgia’s notoriously abundant hospitality, but also the urban folk songs, lullabies, liturgical chants, and historical ballads that still play important roles in everyday moments and grand occasions. The mood varies from dignified and somber to playful and fun, from earthy to otherworldly. Massive thanks to Juliana Voloz of JV Promotion for bringing Iberi to North America and WFMU, and of course to our illustrious engineer Mark Koch! GIG / GIVEAWAY: We're giving away two pairs of tickets to see Anda Union a week from tonight at Merkin Hall. To get in the running for a pair of tickets to this show OR our other giveaway tonight Email me, Rob W, here, please specify first and if possible second choice among the two concerts available, and please put the word "TIX" in the subject line. The deadline to enter is tonight at midnight; winners will be notified by Monday. GIG / GIVEAWAY: We're giving away one pair of tickets to see La Patronal on Tuesday night at Drom. To get in the running for a pair of tickets to this show OR our other giveaway tonight Email me, Rob W, here, please specify first and if possible second choice among the two concerts available, and please put the word "TIX" in the subject line. The deadline to enter is tonight at midnight; winners will be notified by Monday. GIG: Kronos Quartet Live Performance + Film: A Thousand Thoughts @ Town Hall, 123 W 43rd St. Thurs night April 25th at 8. Hello Rob & friends! I'm looking forward to tonight's performance. Hello Rob W ! Hello TSP paradise! Good evening, Rob and worldly listeners. Good evening Ken, Spicy, everyone! Hi Rob! Wow, this is beautiful, thanks for bringing this to us, and thanks Iberi for coming to WFMU! to sing happy birthday every day, wow! Hi slawooy - yes, we recorded this during their tour last summer - they're coming back for a short tour April 3-7. As for Breaking Bad - thanks - you'd think I'd remember that because we watched the whole series but I don't - I'll have to look that up! I always thought it is a turkish song. there is a very well-known turkish version of it: "cilveloy nanay da"
Wow what a show tonight! Magic. Anda Union are great, wish I could see that show. @Rob Weisberg: I sent you an email of music/topics relevant to your interests ..
NGH, you needed that! I hope you're having a fabulous day! I ate cake and listened to my Friday radio shows. It was splendid. NGH, you needed that rest too! Just entering. Rob, your rendition of "Sir Patrick Spens" w/Scott & Hoof/Mouth band was very hep. Rousing folk rock! ..is there an EP in the works? Always enjoy your segment on Wake.... Great show Rob!! Thanks TDK60... I don't think so although I would love my better half Katie (who played the role of the late great Dave Swarbrick on fiddle, complete with cigarette in the strings) to do a Britfolk EP! Great show tonite TPSP, many thanks! Ah, didn't know it was Katie! ..love the Fairport/Steeleye sound. Hear here on the Spens, Rob. You had a sudden Celtic thing happen? Missed the Iberi shaving, I'll have to hit it in the archives. Soul Jazz Recs did a great Georgian vocal polyphonic album about a decade ago, but it was more of the Georgian Orthodox Church liturgical tradition. Was just reading about Zoroastrianism; wild it still exists. Happy Persian new year. Happy Spring everyone! I have had myself a day of spring cleaning and I am so excited about a new chapter of sunshine ahead. peace to you all! This is so beautiful and fitting. Yay Katie! Have to see the archives again. wait. THIS is a gorgeous din!! !